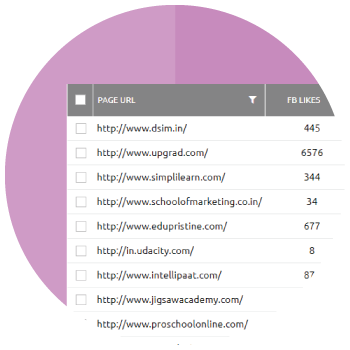 Bulk SEO Metrics Checker: Bulk IP, WhoIs, Social Metrics, PageSpeed, DA, etc. 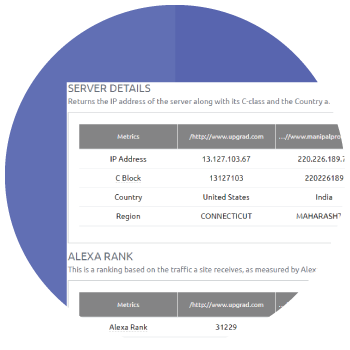 Our Bulk URL Checker lets you collect metrics including Page Rank, Page Speed, Domain Authority (DA), IP Details, Whois Info, Retweet count & much more for a large set of URLs. of a multitude of sites - all at once. 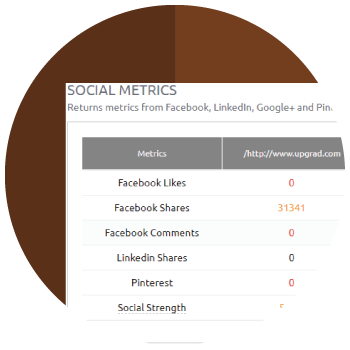 Run a side-by-side comparison of the number of Facebook likes & shares, Google +1s, Retweets, LinkedIn shares and Pinterest posts of up to 1000 URLs. of you vs your competitors. Compare your site with your competitors by taking a closer look at their key metrics like Domain Authority, Google Page Speed, Alexa Rank and more. Also check if there are any malware infections, as detected by Google. Gather and examine all the vital site-related information like domain owner details, domain expiry date, domain age, IP address and Alexa rank, to mention just a few. for your pitches and proposals. Get nice looking side-by-side comparisons of any set of sites. Use the comparison data view to show your clients the areas they need improvement.